The need to upgrade the way dentistry is taught and the curriculum is delivered to 21st century students. The need to incorporate into dental education, modern technological advances in dental materials, novel techniques, principles, and procedures as well as pedagogical tools, all the while considering large shifts in dental practice choices. The need for a curriculum that recognizes what is required in the new, integrated dental board exam to be administered in 2020. Faculty members from four different schools – Tammi Thomas, MD, Vice Dean, School of Medicine; Laura Alipoon, EdD, Chair, Radiation Technology, School of Allied Health Professions; Leo Ranzolin, ThD, Associate Dean, Academic and Student Affairs, School of Religion; Arthur Marshak, EdD, Assistant Professor, Allied Health Studies, School of Allied Health Professions – graciously heard the presentations in round one, and assessed them on the rubric. The top five presentations were posted online for the judgment of LLUSD students, faculty, and staff. Voting determined the winners, who were then asked to present live at the quarterly faculty meeting, where it was announced who placed 1st, 2nd and 3rd. 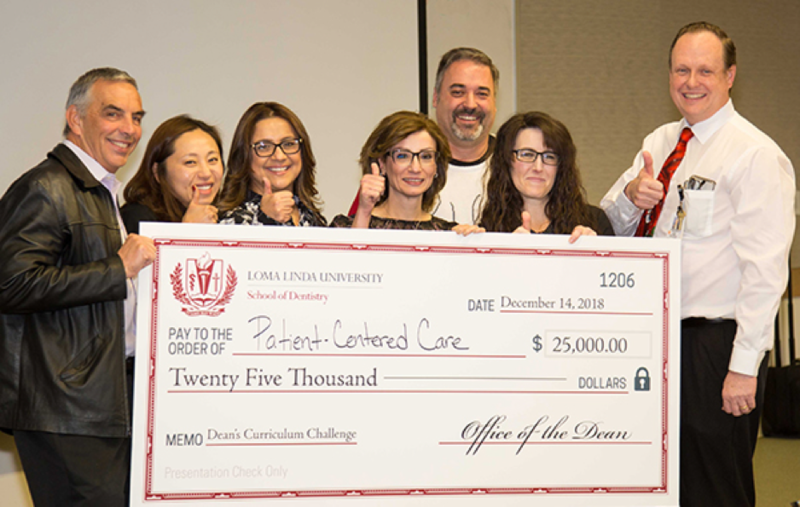 First place ($25,000) entitled Patient Centered Care, went to a team of five, which included both faculty and staff, pictured below. Pictured (L-R) are winners Dr. Michael Fitzpatrick, Dr. Jessica Kim, Elvia Sandoval, Dr. Balsam Jekki, with Dr. Mark Estey, Lisa Nelsen and with Dr. Rob Handysides. 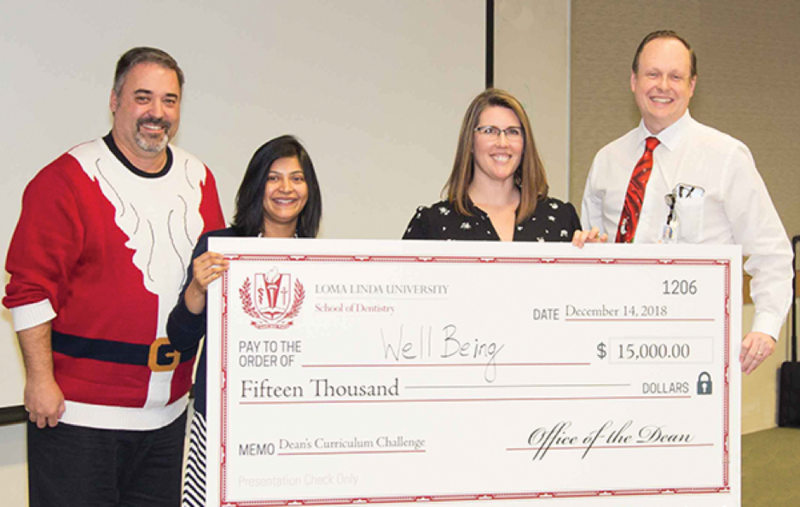 Second place ($15,000), for curricula that fosters Wellbeing was awarded to a team of two: Drs. Anupama Grandhi and Natalie Hohensee, pictured below with Academic Affairs Dean, Dr. Mark Estey and the Dean, Dr. Rob Handysides. 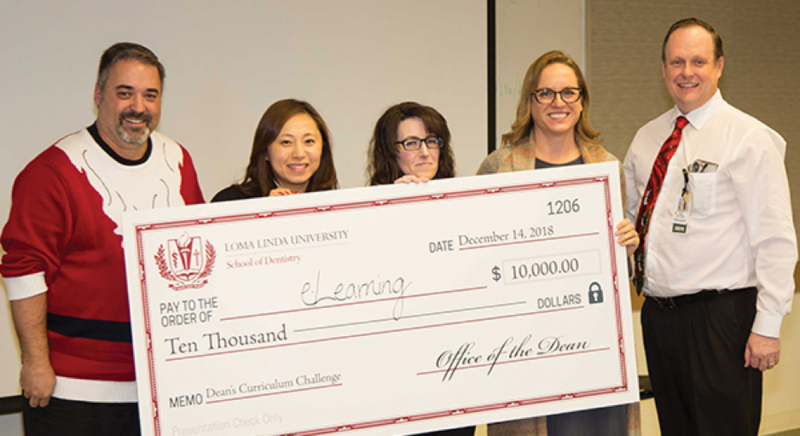 Third place ($10,000), titled eLearning, went to the faculty and staff pictured below with the Deans. Not pictured are Marlise Perry, Dr. Noura Fadel, and Dr. Iris Nam. 3rd place winners (L-R) Dr. Jessica Kim, Lisa Nelsen, and Dr. Holli Riter.